Nigerian Diaspora Day today gives room for somber reflections as I did about this time a year ago through an opinion piece. I stated then “Despite its commendable vision and sparse achievements, the humongous shortcomings of the Diaspora Day are threatening in 2015 to explode in the face of all stakeholders” I concluded the piece with the following “to get the Diaspora Day right, you must first get the Nigerian Diaspora Policy right” Since then, not very much has happened around the Diaspora Policy. However the American idiom “a new Sheriff in town” typically used during periods of power transition could be applied to events surrounding the 2016 Diaspora Day in Nigeria. This adage is deployed particularly when the way things are done are experiencing some changes, or when a new person takes control. In the case of the National Diaspora Day of Nigeria it is a combination of a new operating environment and new persons wrestling back hijacked control from mini cabals of a national policy instrument. This new Sheriff in town is dogmatic about corruption and has a very low tolerance level for it or anything resembling it. I am not sure how he did it but I understand that people around him are self-conscious to the point that they feel that if he looks you in the eyes, he might just read your mind and know if you are thinking of indulging in corrupt practices. That fear alone is already creating some saints around the corridors of power. That is very good because the culture of impunity and financial recklessness in organizing the Diaspora Day until 2013, the year I led the global Nigerian Diaspora delegation to the event in Nigeria, is deafening. I worry for most of the ‘organizers’ of Diaspora Day between 2005 and 2013 because should the new Sheriff decide to order an audit of what had gone on, some may either go on exile or commit suicide before the arms of the law catch up with them. That is how bad I believe it was. I am neither an investigative journalist nor a criminal investigator, so I might not have the capacity to deliver the evidence I hear you thinking about. However I have been a principal actor in the Diaspora politics since inception. Even at that I continue to have unanswered questions. 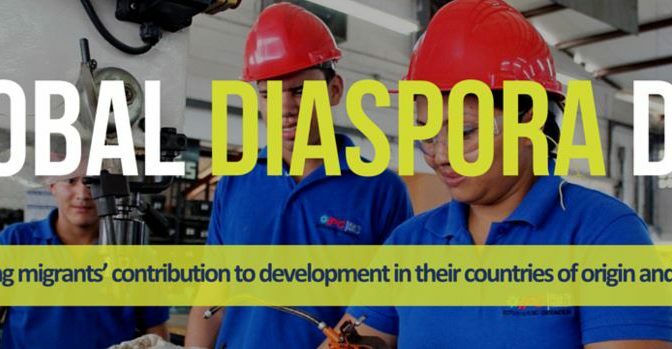 The most cardinal of the questions are: what is the budget for the Diaspora Day event on annual basis since 2005? What have they being spending on and why has the budget remained a secret till date? Who actually manages the budget? How come there has never been a cost-benefit analysis of the annual event? What is the actual reason for the mushrooming of new proxy ‘Diaspora’ organisations, even based in Nigeria? In public financial administration these questions are very basic. They should normally fall under the freedom of information principles of any democracy. A few times I have had conversations with Nigerian legislators and administrators in the Civil Service around these basic but pertinent questions, I am laughed off as one of those intellectuals in the Diaspora that has lost touch with Nigeria because, according to them “this is Nigeria, we don’t work like that here” End of story! Signs are emerging that the end of that story appears to come with the end of an era. It was an era of financial wastefulness, of arrogance of power, of imprudence, of treachery and of national disappointments. By design or accident, just as the new Sheriff came into town, other officials who appear to understand their briefs, who care more for national development than their narrow self-interest took positions in different offices related to the Diaspora. Two calls to mind. Permanent Secretary (Political) Key among them and I speak now as an outsider having taken the backbench after serving out my term as Board Chairman of the Nigerian Diaspora in Europe in 2013, is the Permanent Secretary (Political) at the Office of the Secretary to the Government of the Federation. Unlike those before the current Perm Sec, the gentleman understands that it was for good reasons that President Olusegun Obasanjo facilitated the establishment and recognition of Nigerians in Diaspora Organisation (NIDO) as the official partner of Government on Diaspora matters. The gentleman understands that it is anti-government to work against the policy of the government that you are supposed to be serving. House Committee on Diaspora Affairs & Senate Committee on Diaspora The current Chairman of the House of Representatives Committee on Diaspora Matters seems to understand that micro-management of the Diaspora is not cut out for a federal legislator. The focus should be on the big policy picture rather than the mundane palaver of how the Diaspora should be sidelined in an event over which they should have control. A House Committee Chair who realizes that it is not within her priority space to determine which Diaspora gets which prominent speaking slot at the Diaspora Day. She seems to realize that while it makes sense to relate with all Diaspora organisations, due recognition needs to be given to the body recognized by government as official partners on Diaspora matters. The House Committee Chairman would not act in ways that appears that she encourages the set-up of phony ‘Diaspora Groups’ to unfairly compete with the official Diaspora body, thereby neutralizing their influence and playing into apparent divisions or actually playing a role in encouraging discords amongst different Diaspora communities rather than unifying them. The Diaspora Body A body that appears immune to change both in attitude and strategic approach is the Nigerian Diaspora themselves as embodied by the official body called NIDO. The undemocratic tendencies of some of its leaders are the starting point of its ills. If the way and manner in which you came into office is questionable, you have lost the first major goodwill and recovering credibility and integrity, both ingredients needed to get serious people to believe in you and work with you, may prove difficult if not impossible. The truth of the matter is that lack of credibility and a bit of leadership mediocrity continues to deter popular qualitative participation in the organisation. Next to that, the debate has got to get more serious if NIDO is to move from point A to point B. By way of example, I shall underline two debates that were trending in the run-up to the Diaspora Day but also make the point that on those two occasions, two individual Diaspora provided at different times, two voices of reason. So hope is not entirely lost on condition that they do not shout themselves hoax and give up or that they are singled out by those given to shouting loudest and blackmailed. In a trending discussion, many had decried the poor planning and execution of the Diaspora Day 2016. Just to give you an idea, like many others, I had personally registered on 10 July for the event within an hour of announcement that the online registration form was active. This was for an ANNUAL event holding just two weeks away. I had also indicated, as requested, that I was keen to make a presentation on a USD63 Million infrastructure investment under a private public partnership arrangement with Delta State government involving a number of foreign investors and because Diaspora equity participation would be a desirable thing for country and the Diaspora themselves, it made all the sense in the world to make a presentation at the Diaspora Day and also arrange a site visit to Delta State with interested Diaspora. Registration was not acknowledged until 21 July, three days before the event. Even at that, there was neither an event programme nor a confirmation that the presentation is programmed to hold. I could therefore not firm up arrangements with the project engineers and representatives of Delta State Government who were positively disposed to hosting a breakaway delegation in Asaba. Meanwhile I was torn between flying to Abuja for the Diaspora Day or staying back in Belgium to receive a powerful trade delegation that included serious-minded agricultural commodity traders and other non-oil magnates. Of course given the lack of demonstrated seriousness by the Diaspora Day folks, my decision was easily made. I was staying back in Belgium! The expectation that a clear Diaspora Policy will emerge, in isolation or under the wings of a Diaspora Commission, is becoming more and more an elusive dream. In the interim, as the Diaspora converges in Abuja, my hope is that the fear of the new Sheriff will persist so that the financial recklessness surrounding the Diaspora Day will seize. My other prayer is that the Permanent Secretary (Political) is not moved off his course in maintaining cordial relationship with any and all Diaspora groups while making it clear that NIDO was established in the first instance to put paid to the polarization in the Diaspora community. I understand that the reason the Perm Sec was late in planning and execution is because his Diaspora Day budget was not released on time. Typical, I should say. Keep pushing for a change in that regards but be conscious of the fact that your chances of sustainably sorting that problem out is if you build a formidable coalition to bring about the effective signing into law of the Diaspora Commission. Under the wings of the Commission, the Diaspora Day budget could hang. The leadership of the House Committee on Diaspora should stick with the big picture and continue to reject every temptation to get down to petty Diaspora politics and micro-management. On its part, the Diaspora can use more Sam Afolayans and Kenneth Gbandis, who through their contribution to the debate have shown vision and strategic approach. The author, Collins Nweke served Nigeria’s official Diaspora body first as Executive Secretary / Chief Executive starting from 2004 and later as General Secretary of the Board of Trustees. He finally served as Board Chairman until November 2013. He holds a Doctor of Governance Award (Honoris Causa). A 2014 candidate Member of European Parliament, he writes from Brussels, Belgium where he serves as second-term Municipal Legislator at Ostend City Council.